So the most anticipated dress in 30 years has finally been revealed. And it didn't disappoint. 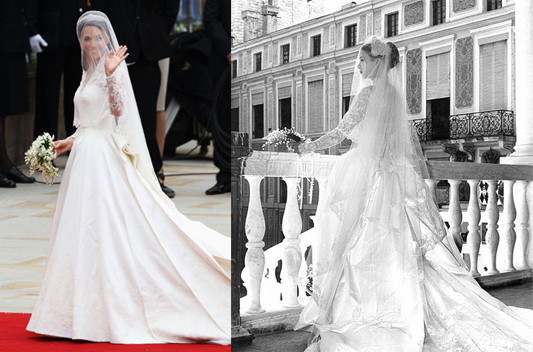 There was certainly a striking similarity to the beautiful Grace Kelly on her wedding day - but hey, if you're going to be inspired by any royal bride Princess Grace should be top of your list. Kate's, or should I say Catherine's, choice is set to influence bridal fashion for years to come. Welcome to 'i do' it yourself. Whether you're looking to express your creative streak on your big day, or just keen to walk down the aisle with a bit more cash left in your pocket, you'll find 'i do' it yourself packed with inspiring ideas for the DIY bride. Each month we pick a theme or colour scheme and follow it through from wedding invitations to table decorations and everything in between! If you have any questions or you would like to share wedding photos, ideas or products. Please get in touch. We'd love to hear from you! Check out our submissions page for more information. © 2012 'i do' it yourself. Inspiring ideas for the DIY bride. ABN 67 352 298 313. Powered by Blogger.